The War of 1812 License Plate is Now Available Order yours today! Virginia Department of Historic Resources' Proposal to install the USS President-HMS Little Belt Affair Historic Marker at the Old Coast Guard Station has been reviewed and approved by the Virginia Beach Arts and Humanities Commission. Trinity Church celebrated its 250th anniversary and added this modest glass artwork to its six Tiffany and three White Friars windows, a challenge for the glass artist. In the predella on the sill in stain glass are Captain Arthur Emmerson's words of 22 June 1813: "Now my brave boys, are you ready?" 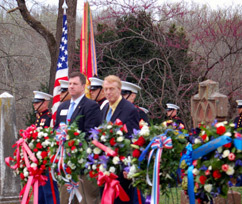 dedicated to the War of 1812 Bicentennial at a service on 24 June 2012. 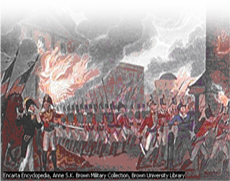 "Virginia Remembers On War Of 1812 Bicentennial"
"War of 1812 began with close votes"
"The U.S. Declaration of War: Virginia Votes for War"
Two groups of Woodberry Forest students ventured off campus for visits to both the nation’s and the commonwealth’s capitals on January 11, 2012. A few dozen drama and speech students spent the day in Washington, D.C., touring Ford’s Theater and the Kennedy Center and seeing a performance of the Broadway musical Billy Elliot. And another dozen headed to Richmond on the invitation of Trustee Emeritus Walter Craigie ’48 to hear a concert played by the Richmond Symphony commemorating the 200th anniversary of the War of 1812. 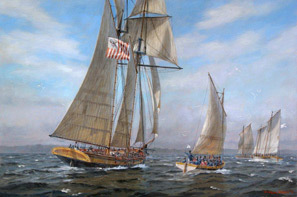 From November 2011 to May 2012, OpSail 2012 Virginia will host world renowned authors for a series of lectures on the War of 1812. This lecture series was created with input and guidance from our work groups and will kick off the OpSail 2012 Virginia activities. Topics of the lectures range from the Chesapeake Bay during the conflict, Dolley Madison's diplomatic legacy to myths and legends of the War of 1812. The Honorable M. Kirkland Cox, Chairman of the Virginia Bicentennial of the American War of 1812 Commission, today announced that the Commission will commemorate the 253rd Birthday of President James Monroe, together with The James Monroe Memorial Foundation, with ceremonies in Richmond on Thursday, April 28, 2011, and in Westmoreland County on Saturday, April 30, 2011. 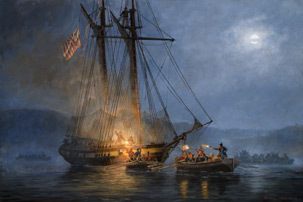 Whether you visit one of the twelve official U.S. Navy Museums, take advantage of public programs and publications, or seek knowledge through the artifacts, documents, images and artwork available at the NHHC, you will find that this is where the history, legacy and traditions of the United States Navy come alive. 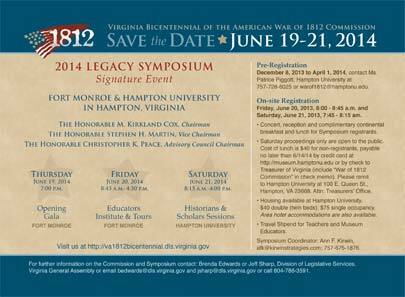 © 2010-2016 Commonwealth of Virginia, Virginia Bicentenial of the War of 1812 Commission. All rights reserved.